Posted on March 8, 2018 . by Patrick Johnstone. Monday’s Council meeting included a Public Hearing on a notable project on Carnarvon Street. Although it didn’t get much media (social or otherwise) before the Public Hearing, it seems to be getting some now, and there was enough going on at the Public Hearing that I think it is worth some discussion here. The proposal will bring a new 32-story tower to the downtown tower district with 204 market strata units. The residential building meets the City’s Family Friendly Housing policy by exceeding the minimum number of 2- and 3-bedroom units. The tower will have a 3-story pedestal which will house commercial storefront space and some amenity space, and a little bit of above-ground parking around the back (more on that later). The tower will share the pedestal with a second 8-story tower that will have 66 non-market rental units run by the Performing Arts Lodges Society (“PALS”), a charity that helps provide affordable housing for veterans of the performing arts industries. Council received two pieces of correspondence in regards to this project, both expressing support. We had 6 people present at the Public Hearing, one expressing concerns that the affordable housing component was not broad-reaching enough, and one local business concerned about the name of the development (see below), and the rest speaking in support (including the proponent, and the president of the New West Arts Council), mostly emphasizing support for the affordable housing component. The project meets the goals of the Downtown Community Plan, was approved by the Advisory Planning Commission and Design Panel, and appears to be well supported by the community. The project puts density adjacent to frequent transit service and within walking distance of most services. The location also means we can bring new density and affordable housing on line without displacing other low-cost housing. As one delegate at the Public Hearing mentioned, this is clearly not the entire answer for affordable housing. Far from it. Our regional housing affordability crisis exists at every level: professionals not able to afford family-sized homes; working poor facing demo-viction and rising rents; people with barriers to traditional housing lacking adequate supports, it’s a mess. No single project can fix all of these. What this project does, though, is address one identified gap, and engage a not-for-Profit in helping with that. This project is similar in that sense to the two small affordable housing projects the City is supporting on City lands, each identifying a specific group in need of housing and a service agency taking on the charge to help operate that housing. The PALS project helps people who have worked on building the cultural quality of our community, and recognizes that people working in the performing arts rarely have pension plans or stable retirement income. By providing space in our community for dozens of experienced actors, writers, dancers, singers, production designers, directors, choreographers (etc., etc. ), we promise to enrich our community’s culture. They will be the story tellers, the teachers, the artists that support a vibrant cultural future in New West. I don’t think we can measure the positive impact that could have in our community. I have expressed concern in the past about Carnarvon Street and its urban expression. I think the Plaza88 development does not address the street well, and is out of scale with the pedestrian space we want to have downtown. I am more enthused by the urban design of this project, as it is well articulated, includes an open public plaza area, and appears to provide lots of eyes on the street, as opposed to a large wall of parked cars behind screens. At initial readings and again at Third Reading, some concern was raised by some of Council about the parking situation. Between resident and visitors parking, this project will have 275 parking spaces, most of them underground. That is more than one parking spot per unit in a building that is across the street from a SkyTrain Station and walking distance to all amenities. The cost of building these parking spots (which could be more than $60,000 a spot!) must shift the cost of the units in the building – both affordable and not. We need to question why we are spending so much finding warm dry spots for cars when we are struggling to afford warm dry spots for people. The project was designed to meet the City’s parking minimums, and shifting the goalposts for the developer at this stage in the process would be pretty onerous, and potentially threaten the project. 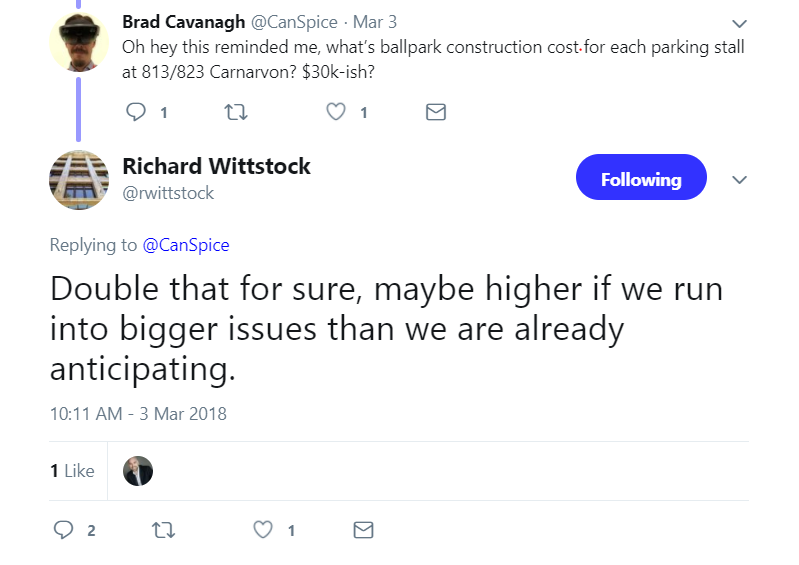 However, this has raised the conversation at Council that our downtown parking standards need an update if we hope to make housing more affordable and meet the goals of our Master Transportation Plan. This conversation will be ongoing, and I’d love to bend your ears for a few hours about it. Finally, the marketing department of the developer has some work to do, as they had found a great name for the development that was, unfortunately, almost indistinguishable from the name of a young but established business on the same side of the street about a block away. The business owner came to delegate to Council and expressed support for the project (the Arts community supports their own!) but was worried about potential impact on her business. The City has no regulatory role on the naming of developments, and having a legal fight over Trademarks and registered business names will only enrich lawyers and take time. Both parties have had an initial and positive conversation, and felt confident that a compromise could be found, so Council asked that they find a mutually acceptable solution prior to the project coming back to Council for Adoption. Overall, this project is a net positive. In my opinion there are significant benefits to the community: affordable housing that adds to the City’s cultural diversity, improved public spaces, DCCs, density bonus and VAC money that contributes to community amenities, family-friendly housing diversity, density near SkyTrain, and a refreshed area of downtown bringing supporting customers to our business district. I just hope those lens flares don’t keep the neighbours up at night. This plan for high-density buildings close to a transportation hub obviously has the potential to increase business for existing businesses and encourage new businesses to the area. 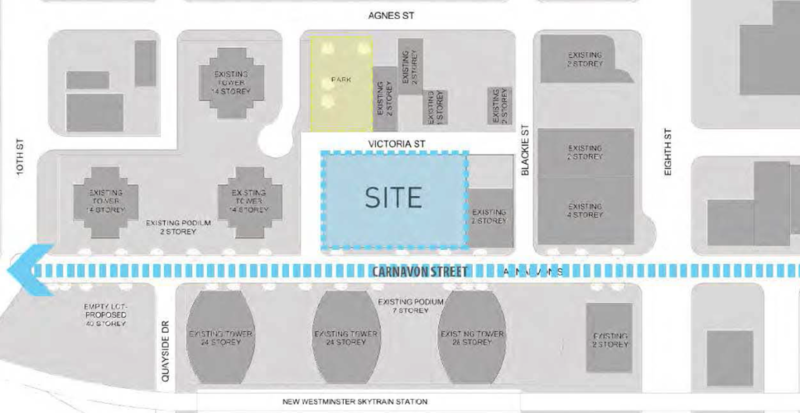 Also, this has the potential of making Columbia Ave. A destination shopping area as Baker Street has done for Nelson.